Thanks to the operation of the Vestibular System, located in the semicircular canals of the inner ear, we are able to orient ourselves in three-dimensions. The sense of equilibrium allows us to walk, swim, fly and move about, retaining a sense of orientation with respect to the sky above, the earth below, as well as knowing what is in back of us, what is in front, and how parts of our body are oriented with respect to the rest of our body. Meditators can develop awareness of the flow of neural information being piped directly to the perceiving brain from the tiny cilia that serve as “angular accelerometers” detecting all movement in the head, keeping our vision from blurring by making tiny adjustments in our eye muscles to maintain a static focus on the objects of attention even when our heads are in motion. Furthermore, when a person’s body settles into stillness, the vestibular system continues producing "resting discharge activity" to indicate the lack of movement stimuli. It is hypothesized that this “resting discharge activity” signals to the perceiving mind that it is safe from threat and may settle into rest. It is further hypothesized that the activity of meditation may be simplified by realizing the concrete, physiological benefit of consciously attending to this “stillness signal,” thus generating a feedback loop that allows for deeper and deeper stillness in both body and mind. Quotes from scientific literature to sustain this hypothesis are provided below. The semicircular canals are the body's balance organs, detecting acceleration in the three perpendicular planes. These accelerometers make use of hair cells similar to those on the organ of Corti, but these hair cells detect movements of the fluid in the canals caused by angular acceleration about an axis perpendicular to the plane of the canal. Tiny floating particles aid the process of stimulating the hair cells as they move with the fluid. The canals are connected to the auditory nerve. The following information on the primacy of the Vestibular Nerve as the first to develop in the foetal body is quoted from Kay Hogan's online essay "The Ear and The Alexander Technique" at http://www.kayhogan.com/articles_ear.htm, quoting Hannaford, C. (2002), Awakening The Child Heart. Jamilla Nur: Hawaii. Nerves myelinate (fully develop) in order of their importance for survival. The first cranial nerve to myelinate in utero is the vestibular nerve (sensory nerve with some motor nerve functions) whose primary functions are balance and energy. A two-month-old embryo hears and reacts to sound by opening and closing the arms and legs, these movements are the Moro reflex. "The newborn hears and moves in rhythm to the mother's voice in the first minutes of life. There are no random movements; every movement of the newborn has meaning, with particular movements being linked to particular sounds. For example, with a sudden loud sound the baby will throw out its arms and legs in a Moro Reflex. In response to his mother's voice, he will turn toward her. Studies done using high-speed film show that newborns and infants have a complete and individual repertoire of body movements that precisely synchronize with syllables or sub-syllables of a speaker's voice. This important matching of movement to words, or "entrainment", starts in utero at about four and a half months and leads to full development of the vestibular systems and the ability to language successfully." The Vestibular Nerve begins to myelinate in utero by registering the movement of the fetus and its environment (mother). After birth the vestibular system is necessary for the infant's survival in the new environment, which is gravity. The vestibular nerve is involved in the sense of equilibrium, maintenance of posture and muscle tone. The other purpose of the newly myelinated nerve of the hearing organ is the electrical charge that the brain receives from sound and that is crucial for brain development. In these early stages, it is the mother's voice that the baby has entrained to, and in particular to the high frequencies that are most enriching for the infants' brain development. "We instinctively talk to babies with a higher voice, called "Parentese", which we now know energizes the baby's brain, making it more alert to all sensory input and able to take in specific patterns and rhythms, thus aiding leaning." It is the motor nerves that myelinate before the sensory nerves, meaning that movement awakens the senses. We need movement and that includes sound in order to sense or perceive our environment and ourselves. Movement is crucial to learning in both the internal environment and external environment. Both sound and movement are crucial to the early developmental reflexes. [M]y quest to understand the origins of human love and violence was partly rooted in my doctoral training in developmental neuropsychology and psychophysiology at McGill University, Montreal, P.Q. Canada where I was made acutely aware of the extraordinary importance that the early sensory-social environment has upon brain development and behavior. The pioneering studies at McGill in the 1950s and 1960s documented that social isolation rearing of puppies results in not only aberrant adult emotional-social behaviors but also in abnormal brain development and functioning. In 1966, I joined the newly formed NICHD where I created the Developmental Behavioral Biology Program (NICHD) to establish basic research programs on brain-behavioral development. During my tenure at the NICHD (1966-1980), I formulated a novel developmental brain-behavioral theory of emotional-social regulation to explain the pathological depression and violence that results from maternal-social deprivation or the social isolation rearing of infant animals. I redefined "maternal-social deprivation" as a special case of Somatosensory Affectional Deprivation (SAD) and identified somesthetic processes (body touch) and vestibular-cerebellar processes (body movement) as the two critical emotional senses that define the sensory neuropsychological foundations for maternal-infant affectional bonding. Sensory deprivation in the other sensory systems (vision, hearing, smell and taste) do not result in the maternal-social deprivation or SAD syndrome). My reconceptualization of the maternal-social deprivation syndrome which involved cerebellar-limbic-frontal lobe brain functions was made possible by the pioneering studies of Mason (1968) and Mason and Berkson (1975) who demonstrated that the isolation rearing of infant monkeys on a "swinging mother" surrogate (vestibular-cerebellar stimulation) prevented the development of the classic maternal-social (SAD) syndrome. This behavioral study opened the "vestibular-cerebellar" gate to brain structures and processes not previously implicated in these emotional-social disorders and represents, in my view, a scientific study of such importance that is matched only by the original contributions of the Harlows. The implications of the Mason and Berkson "swinging mother surrogate" study for human development is profound but, unfortunately, remains unappreciated despite the fact that its dramatic effects can be seen in the Time Life documentary film "Rock a Bye Baby" (Dokecki 1973) and which has been one of the most successful documentaries of Time Life. It is important to emphasize that in terms of SAD theory, the different sensory-emotional systems of the body provide the neuropsychological foundations for different psychological states. Specifically, the vestibular-cerebellar sensory system provides the primary neuropsychological foundation for "Basic Trust"; the somesthetic (touch) sensory system provides the primary neuropsychological foundation for "Affection"; and the olfactory (smell) sensory system provides the primary neuropsychological foundation for "Intimacy". In normal development these emotional-sensory systems are combined in rich patterns of complex sensory stimulation which results in the development of a "neurointegrative" brain where "Basic Trust", "Affection" and "Intimacy" are integrated with one another to form an emotional brain gestalt that can be called "Love"– long before the infant can understand the spoken or written word which is mediated by the auditory and visual cognitive senses. The vestibular system is phylogenetically the oldest part of the inner ear. It is situated in the petrous part of the temporal bone, in close proximity to the cochlea. The vestibular system responds to movement of the head relative to space and gravity, using inertial-sensing receptors which are activated by forces arising from the acceleration of mass in accordance with Newton’s law: Force = Mass X Acceleration. In order to determine the absolute movement of a body in three dimensional space, reliable information is required about movement in each of the 6 "degrees of freedom" permitted in three dimensional space, i.e. three translation or straight lines (up-down, left-right, fore-aft), and three rotational (in one horizontal, and two vertical planes at right angles to each other) movements. 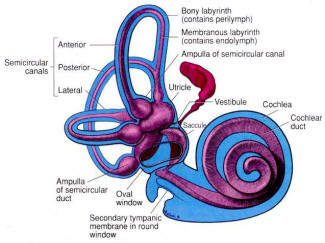 There is one vestibular system on each side of the head, in close approximation to the cochlea. 2. a set of three semicircular canals, arranged at right angles to each other, sensing rotation movement in three planes. The utricle and the saccule are two sac-like structures each of which contains a specialized region (the macula) which is made up of a ciliated sensory epithelium (the vestibular hair cells). In humans, the hair cells in the vestibular system differ somewhat from those in the auditory system, in that each vestibular cell, in addition to having a number of thin stereo-cilia, also has one thicker longer kino-cilium positioned at one end of the cell’s hair-bearing surface. The hair cells of the vestibular system also exhibit a constant "resting discharge activity" even in the absence of a stimulus. Thus, stimulation is sensed by the central nervous system as a change in this resting, "spontaneous" discharge rate. The cilia which emerge from the hair cells are embedded in a gelatinous matrix containing solid CaCO3 crystals (the otoconia) which overlies the cells. During linear acceleration, the crystals (being denser than the surrounding fluid) will tend to be left behind due to their inertia. It has been demonstrated that the resultant bending of the cilia causes cell excitation when the bending is toward the kino-cilium (with a resultant increase in the firing frequency of the innervated afferent sensory fibres of the VIII th nerve), and inhibition when away from the kino-cilium (with a resultant decrease in the firing frequency of the innervated afferent sensory fibres of the VIIIth nerve). Since they are sensitive to acceleration, the otolith organs detect the direction and magnitude of gravity, as well as transient linear accelerations due to movement (for example: tilting the head produces a transient linear acceleration which is reflected in changes in the firing frequency of afferent fibres innervating the sensory cells). To provide a subjective sensation of movement and/or displacement in 3-dimensional space. For example, the hair cells of the utricle provide a sensation of head tilt based on the direction in which the cilia are bent by the gravitational force. When the head is tilted in the direction of polarity of a given cell, it depolarizes and excites the afferent fiber. Alternatively, when the head is tilted in the opposite direction, the same cell hyperpolarizes and inhibits the afferent fiber. To maintain upright body posture (balance). A variety of reflexes of the limb musculature, are mediated by activation of the otolith organs and semicircular canals. When the vestibular system is activated these reflexes result in the stabilization of the head's position in space (vestibulospinal and otolith-spinal reflexes). To control the muscles that move the eyes, so that in spite of the changes in head position which occur during normal activities such as walking and running, the eyes remain stabilized on a point in space . The eye movements which are generated by activation of the vestibular system are called vestibulo-ocular reflexes and are discussed in greater detail on the next page. Unblurred vision is only possible if the eye is stationary (fixed) with respect to a viewed object. The vestibulo-ocular reflex (VOR) is an important mechanism by which unblurred vision is made possible during head movements that are generated during everyday activities such as walking and running. For example, if the head is turned to the left, this reflex causes the eyes to move to the right (i.e. 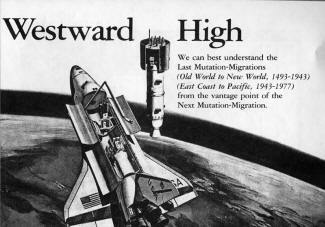 in the opposite direction of the head movement). The oppositely directed eye movement occurs at the same velocity as the head movement, and therefore generates an eye movement which keeps our line of sight fixed on the same point in visual space both during and following the movement. During short head movements, these compensatory eye movements remain well within the mechanical limits of eye rotation. However during large amplitude head rotation, the eye can reach its limit of excursion long before the head movement is completed. Consequently, during this condition, an additional feature is added to the VOR: when the eye reaches an extreme position, it is rapidly flicked back to a new starting position. From this new starting position, the eye then continues a new cycle of compensatory movement during continuing head movement. The resulting "saw tooth" pattern of slow compensatory/ rapid resetting eye movements (slow phases and quick phases respectively) are referred to as vestibular nystagmus.